The recent rain in So Cal has many of my clients crying uncle. Formerly housetrained pups are pottying on the floor while others are going stir crazy from lack of exercise. Here are some tips to help your dog (and you!) beat the bad weather blues. Establish good habits from the start with young puppies. Resist the urge to use potty pads when it rains (I know it seems easier now but see note number two below!). Instead take him outside and make a big deal about him going even though it is wet. If your dog has a tendency to make potty mistakes as soon as the grass is damp go back to the basics. Take your dog out at regularly scheduled intervals (yes, this may mean you need an umbrella) and reward for pottying outside. If your dog is particularly stubborn about going in the rain confine her to small area or room (think puppy potty training 101) and try again an hour later. Do not allow her full reign of the house until she is successful. For active dogs the lack of exercise that often comes with inclement weather can lead to boredom (read: getting into trouble). Provide mental stimulation with training sessions, chews or Kongs stuffed with peanut butter and frozen, and inside fetch sessions. 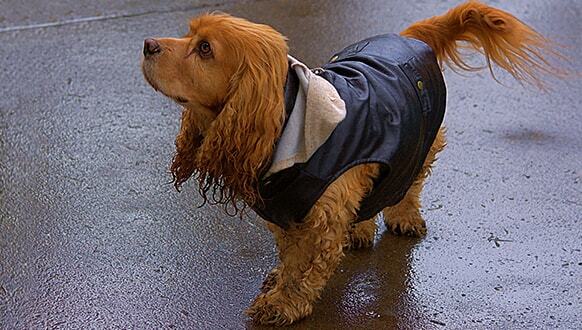 Try to get your dog out when there’s a break in the rain, even if it’s short lived. Take some time to cuddle up with your pup for some extra love and attention, after all, isn’t that what rainy days are best for? Check Out the Winter Newsletter Today! Your pup’s favorite things are a gift for them (and you!). Remember a tired, content dog is a well-behaved one! Daily exercise! This one is free, and good for you both! Shoot for a minimum of 30 minutes per day for more mellow pups, and an hour+ for young or active breeds. Regular training. Even if your pup is a master of the basics, training is important mental stimulation and builds confidence. Incorporate tricks and other games into your routine to make things fun and interesting. Quality time and new experiences – spend some down time giving your dog the love and attention he craves, or take her to new places to explore (parks, shopping centers, doggy daycare). Structure! Believe it or not, dogs love clear cut rules and knowing they can depend on you as their leader. If being consistent isn’t your thing this one to add to your New Year’s resolution list! 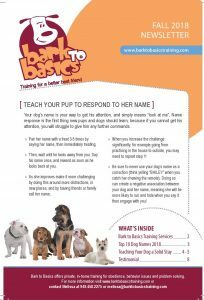 Bark to Basics Fall Newsletter – Teaching Name and Stay, Ask the Trainer and More! Check out the Fall newsletter now! ‘Tis the season of new puppies coming home! Over the past 13 years I have been lucky enough to work with many pups as they are welcomed into their new homes. Lots of clients call asking for help with potty training, play biting and the basics. While these are all very important in having a well-behaved companion later in life, an even more important training area is often overlooked – socialization. I’ve not only seen the cute, wiggly, happy puppies over the years, but also the serious problems that occur later in life with dogs who are not properly socialized while they are developing. Between the aggression, reactivity and fears I’ve worked with in my client’s dogs, and rescuing two of my own who were severely undersocialized early in life, I know just how important socialization is for pups. When you bring your puppy home (yes, even before all their shots!) it is imperative to get them socialized with new things (think bikes, cars, kids, other pets, and humans of all shapes, sizes and ages). Your vet will guide you on when it is safe to bring your puppy out in the world, but in the meantime you can bring the world to him in the form of visits from friends and family and their healthy, vaccinated dogs. Have newcomers greet your puppy with a favorite treat or toy, and if you encounter something she finds “scary” stop and give her time to check it out (tossing treats near the object helps too)! Socialization is imperative to having a happy, well behaved and well-adjusted adult dog. Without proper socialization young pups can grow up to be dogs with fear and territorial aggression and anxiety. The key window for socialization is between 4-14 weeks of age. Talk to your vet about your puppy’s vaccine schedule and what is safe at each stage. 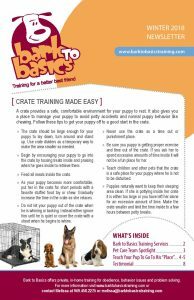 You have a great opportunity to socialize your puppy now to help him to become the best puppy he can be! From four to twelve weeks, your puppy’s interaction with people becomes more important. 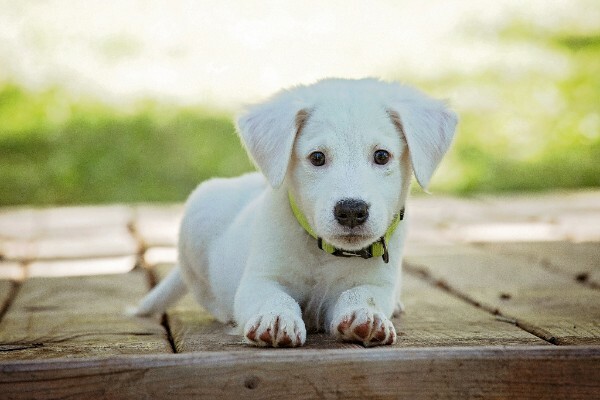 They learn to play with littermates, develop social skills and bite inhibition and begin to understand social boundaries and hierarchy. At eight to ten weeks, your puppy can experience real fear involving everyday objects and experiences. Positive reinforcement with new experiences is important during this stage. At nine to twelve weeks your puppy’s social skills with others advance, and he will begin to investigate his surroundings more. This is a great time to start training.